It is inevitable that, from time-to-time, conflict and disagreement can arise due to the differing needs, wants, aims and beliefs of the people who are brought together. Without negotiations, such conflicts may lead to argument and resentment resulting in one or all the parties feeling dissatisfied. Negotiation is normally done so as to reach agreement without causing future barriers to communications. Negotiation takes place when two or more people/parties, with differing views, come together to attempt to reach agreement on an issue. It is persuasive communication or bargaining. Negotiation is a cooperative process whereby participants try to find a solution which meets the legitimate interests of the negotiating parties. It is the process between two or more parties to settle differences. In the process of negotiation parties try to reach compromise or agreement while avoiding argument and dispute. In case of any disagreement, parties understandably aim to achieve the best possible outcome for their position (or perhaps an organization they represent). However, the principles of fairness, seeking mutual benefit and maintaining a relationship are the keys to a successful outcome. The word ‘negotiation’ originated from the Latin expression, ‘negotiatus’, which means ‘to carry on business’. Negotiating is the process of communicating back and forth, for the purpose of reaching a joint agreement about differing needs or ideas. It is a collection of behaviours that involves negotiation skills, communication, sales, marketing, psychology, sociology, assertiveness and conflict resolution. A method of negotiation is usually judged by three criteria namely (i) it should produce wise agreement if agreement is possible, (ii) it should be efficient, and (iii) it should improve or at least not damage the relationship between the parties. Negotiations are viewed ‘hard’ where the participants are adversaries, the goal is victory, there is application of pressure, there is distrust between participants, and there is demand of concessions as a condition of the relationship. Negotiation is considered ‘soft’ when the participants are friends, goal is agreement, concessions are made to cultivate the relationship, there is trust in each other, and there is no imposement of the viewpoint of one of the party. For achieving a desirable outcome, it is always useful to follow a structured approach to negotiation. The structured approach which is normally followed in a formal negotiation has six stages. These six stages in the process of formal negotiation are as follows. Preparation – Before any negotiation takes place, it is necessary for the parties to agree when and where the meeting will take place to discuss the differences and who will attend. Setting of a limited time period for the meeting also sometimes helps to prevent the disagreement continuing. This stage involves ensuring all the pertinent facts of the situation are known to each party in order to clarify the position. Undertaking preparation before discussing the disagreement helps to avoid further conflict and unnecessarily waste of the time during the meeting. Discussion – During this stage, spokesman of each party put forward its case. Key skills needed during this stage include questioning, listening, and clarifying. Sommetimes it is helpful to take notes during the discussion stage to record all points put forward in case there is need for further clarification. It is extremely important to listen, as when disagreement takes place it is easy to make the mistake of saying too much and listening too little. Each party should have an equal opportunity to present its case. Clarification of goals – From the discussion, it is necessary that the goals, interests and viewpoints of each party with respect to the disagreement are clarified. It is helpful to list these factors in order of priority. Through this process of listing, it is often possible to identify or establish some common ground. Clarification is an essential part of the negotiation process, without it misunderstandings are likely to occur which may cause problems and barriers in reaching a beneficial outcome. Negotiate towards a win-win outcome – This stage focuses on what is termed a ‘win-win’ outcome where both the parties feel they have gained something positive through the process of negotiation and both the parties feel that their point of view has been taken into consideration. A win-win outcome is usually the best result, although this may not be always possible through negotiation. However, it should be the ultimate goal. Suggestions of alternative strategies and compromises need to be considered at this point. Compromises at this stage provide often positive alternatives. These compromises can often achieve greater benefit for all concerned compared to holding to the original positions. Agreement – Agreement can be reached once understanding of the viewpoints and interests of both the parties have been considered. It is essential that each party should keep an open mind in order to achieve an acceptable solution. Any agreement needs to be made perfectly clear so that both the parties clearly know what has been decided. Implementation of a course of action – A course of action that needs to be implemented to carry through the decision flows from the agreement. Each party is to take this course of action so that the agreement can be implemented. If the process of negotiation breaks down and agreement cannot be reached, then a further meeting becomes necessary which need to be rescheduled. This avoids all the parties taking part in the negotiation to get embroiled in heated discussion or argument, which not only wastes time but can also damage future relationships. At the subsequent meeting, the stages of negotiation are to be repeated. Any new ideas or interests should be taken into account and the situation looked at afresh. At this stage it may also be helpful if each party look at other alternative solutions and/or bring in another person to mediate. At many times there is a need to negotiate in a more informal way. During such times, when there is a difference of opinion, it may not be possible or appropriate to go through the stages set out above in a formal manner. However, remembering the key points in the stages of formal negotiation can also be helpful when there are situations for informal negotiations. There are three important elements in any negotiation. These are attitudes, knowledge, and interpersonal skills. These elements are likely to affect the ultimate outcome of the negotiations. These three elements are described below. Attitudes – All the negotiations are strongly influenced by the attitudes of the person negotiating. Attitudes of the negotiators can relate to certain issues or relate to personalities. It may be remembered that the negotiation is not the process for the realization of individual achievements of the negotiator. 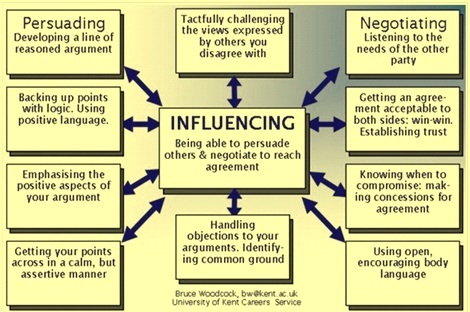 Attitudes of the negotiators can be aggressive, defensive or friendly (co-operative) depending on the situation. Best results of negotiations are achieved when the people conduct the negotiations in a co-operative environment. Knowledge – The knowledge of the negotiators regarding issues involved in the negotiations results into their greater and effective participation in the process of negotiation. This influences the outcome of the negotiations. Hence good preparation for the negotiation is essential. Negotiators can improve their knowledge of the issues by an effective homework and by gathering in advance all the informations of the issues involved in the negotiations. Further knowledge of different methods of negotiations helps in making progress during negotiations, since negotiators can use different methods of negotiations in different situations. Interpersonal skills – Good interpersonal skills are necessary for an effective negotiation. Interpersonal skills aids in both formal and informal negotiations. The interpersonal skills which are essential for effective negotiations include effective verbal communication, listening, reducing misunderstandings, rapport building, problem solving, displaying assertiveness, persuasiveness, decision making, communicating effectively in difficult situations, and keeping calm without getting excited. In case of positional negotiations, negotiators are locked into positions and tied to egos. Hence this type of negotiation results into unwise agreements. This type of negotiation is inefficient negotiation since more attention is paid to the positions rather than to solving the issues that are having concerns of the negotiating parties. In such negotiations incentive for settlement is missing and arriving at a common position becomes very difficult. Further, during multi party negotiations, arriving at any agreement becomes further complicated with positional negotiations. The characteristics of a negotiation carried out in a principled manner consist of the following. People are separated from the problem. Hence there is no scope for misunderstanding, emotion, perceptions, and values to affect the negotiations. Focus is on issues and not on positions. Focusing on issues helps the other side to understand how important and legitimate the viewpoints of the first party are. Reservation value is the difference in amount of reaching a deal and the BATNA.Zone of possible agreement (ZOPA) is the bargaining range created by the two reservation values. ZOPA is the surplus that is to be divided between the two negotiating parties.